So, it was over the past two winters, curled up in the office of my parents' nice cozy house, that I planned this little farm. In any event, I just had to post a few photos of last week's garden escapades! 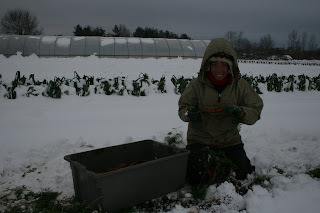 Thanks to Anna McFaul, Orchard Hill's intern extraordinaire, for trekking through the snow with me to find the carrots.! Huge thanks also to the farm members who braved the elements over the last week to come help with harvest and washing! And we're talking extreme farming here! 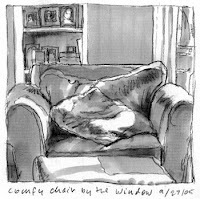 And thanks to Ken as well for taking the photos. But, as you can see in the photos, we're still smiling! Farming really is fun, even if a it's a little crazy sometimes! 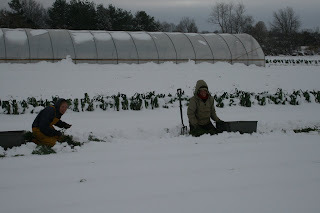 Anything for the best CSA members around, and the veggies we all love!